Pune: International cyclist Rutuja Satpute will be leading Maharashtra Cycling Team in the upcoming 22nd National Road Cycling Championship. This National Championship is scheduled to happen at Jamakhandi, Karnataka from 28th October to 1st November, 2017. Maharashtra Team has been selected from state level selection test conducted in Nashik and Ahmednagar and training camp conducted in Narayangaon in the Pune district. Ms. Meenakshi Thakur, Pratap Jadhav, Prof. Sanjay Sathe and Biru Bhojne selected the final team. Due to the efforts of Mr. Pravin Patil, MD & CEO-Starkenn Sports Pvt. Ltd, Maharashtra Cycling team has received an award of worth 35 lac from Starkenn Sports. Maharashtra Team has got 6 premium bicycles and cycling spare parts worth rupees 35 lac. 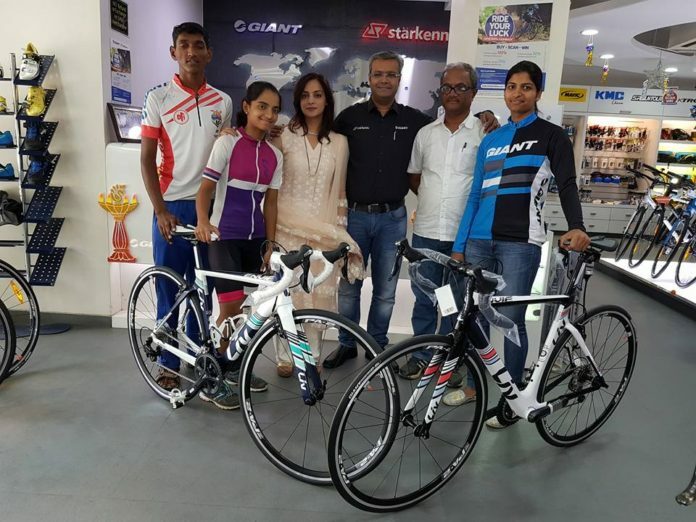 These new bicycles are given to Rutuja Satpute, Pranita Soman (4 gold medal in MTB 2017), Vivek Waykar (2 silver medals in MTB 2017), Komal Deshmukh (winner of National track and road championship) and Yashodhara Sherkar (2 gold medals, MTB, 2017) for the practise and the tournament. Training camp of Maharashtra cycling team was going on from 10th October under the coaching of Biru Bhojne in Narayngaon in Pune district.